The Kuru Toga is a mechanical pencil from uni / Mitsubishi pencil. In Japan it has been available for more than a year. The plastic version is now officially distributed in the UK and other countries, while the successor, the new Kuru Toga pencil, is already available in Japan. The Kuru Toga’s unique selling point is that its lead rotates which keeps the tip sharp when writing. When pressing the lead against the paper to write or when lifting it the gears of the “Kuru Toga Engine” revolve, rotating the lead slightly. After reading a review of the Kuru Toga on Dave’s Mechanical Pencils I was really impressed and quite excited when I saw that the Kuru Toga is now officially available in the UK. Cultpens.com sells this mechanical pencil in many different colours for £ 7.99 (~ € 8.90). I bought mine from Ryman, a High Street chain, for £ 4.99 (~ € 5.50), but unfortunately they only seem to stock the black version. My first surprise, when I saw the packaging, was that the advantages of the Kuru Toga Engine were not advertised as much as I expected. Somehow I expected this pen to stand out from the other pens on the shelf, but this wasn’t the case at all. For the designers who created the packaging the Nano Dia leads seem to be nearly as big a selling point as the Kuru Toga Engine. If you are in marketing or advertising it might be difficult to resist telling the potential customer about the “400 million nano diamonds” in each lead. Yes, nano is a buzzword (see PhD Comics) and diamonds sound very precious, but instead of just throwing numbers and cool words at customers I would have preferred an explanation why having 400 million nano diamonds in a lead is an advantage and how that helps to deliver super strength and a smooth, crisp line. Using the Kuru Toga for writing was a big disappointment. The pressure I exert when writing “normally” does not seem to get the lead to rotate. I could of course press the pencil down harder to get the gears to revolve and consequently the lead to rotate, but that is not how I would normally write. Real world use has shown that when I write in a hurry I use more pressure and the lead will rotate, but the lead should rotate whenever I write,not only when I write in a hurry. When using more pressure the lines tend to get wider anyway and I got better results, i.e. thinner lines, by rotating the pencil in my hand. Two possibilities come to mind when looking at the problem of the non-rotating lead. 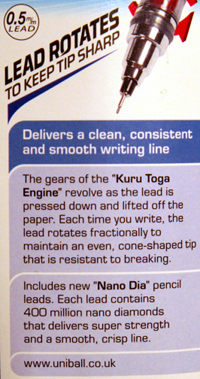 It might be a substandard pencil, and other Kuru Toga Engines work with less pressure. This would would mean that there is a quality control problem at uni / Mitsubishi pencil. This is probably not the case. I might not press the pencil down hard enough to get the gears to revolve. This could be because of many years of using fountain pens (which do not need a lot of pressure) and a relatively infrequent use of ballpoint pens (which need much more pressure). When I went to school you had to write with a fountain pen and today I still like to use fountain pens and avoid ballpoint pens. My wife, for example, is using much more pressure when writing. the relatively high price for a mechanical pencil compared to similar pens made from plastic …more than twice the price of a Rotring Tikky, which is usually £ 1.99 (~ € 2.20), but to be fair: the Tikky does not come with a pack of replacement leads. It is difficult to predict, but my guess would be that the market share of pencils using the Kuru Toga engine or similar mechanisms will increase, because they are great of they work for you. On the other hand most mechanical pencils still do not even have a retractable sleeve and most consumers do not really seem to care but buy what is available and cheap. Assuming you usually write in a Western language and use joint writing a lot (I do) the lead will also not rotate as much as it would if you use block letters or South-East Asian characters ..unless you apply different levels of pressure. Thank you for that detailled review! Your thorough analysis of the pencil, its packaging and the usage is very impressing. Congratulations on launching a new blog. This first article is a great start! You make some good points. I look forward to future articles. Stephen and Kiwi-d, thank you both very much for your encouraging comments! Ansonsten: schön geschrieben, weiter so! Ich habe gerade den Kuru Toga auf einem Formular mit Durchschlagpapier probiert (die neuere Art, nicht Kohlepapier). Bei meinem normalen, d.h. schwachen, Druck kann man den Durchschlag gerade so erkennen, aber der Mechanismus wird nicht ausgeloest. Ich glaube nicht, dass ich eine Waage habe, die fein genug ist …sonst koennte ich messen wieviel Druck bei meinem Exemplar benoetigt wird. Wenn es eine Fehlproduktion ist, ist das kein gutes Aushaengeschild fuer Uni / Mitsubishi, kann aber wohl bei einem Plastikfeinschreiber in diesem Preisbereich akzeptiert werden. Both of my Kuru Togas (plastic/1st, metal/2nd) work perfectly. Is it possible that the mechanism of your Kuru Toga is blocked by dirt? It might be blocked by dirt, but the pencil was straight out of a sealed package and I cannot see any dirt. Are yours working perfectly when you write with very little pressure? It sounds as if I was unlucky and got a sub-standard pencil …which would indicate that either the ones produced for the UK are differently to those made for Japan (I assume you imported yours from Japan) or uni / Mitsubishi has a QC problem (or better QC for products sold in Japan). I imagine the non-rotation is a problem caused by not pressing hard enough and/or the angle you hold the pencil at. I hold my pencils fairly upright, but perhaps as an FP user you hold the pencil at a much lower angle and thus even though you have enough pressure on the lead to write, there is not enough axial pressure to engage the gears? I have two first generation “Kuru Toga” MP’s, a .3 and .5mm and a .3mm version of the new “Kuru Toga High Grade” model, all work fine. hold your pencil in a vertical position and then press the end of metallic lead sleeve repeatedly (this will retract the lead, of course), you will be able to see the pencils engine rotating, the logo printed on the engines case will move, if not, your pencil has a problem. Congratulations on the blog, i’m looking forward for new posts. I’m so glad you wrote this! I thought I was the only one with the non-rotating lead problem. I’ve never pressed down hard on my mechanical pencils because I dislike breaking lead. In addition, I’m left handed and write by slanting the paper severely, up to 90 degrees! I also wondered vaguely about QC issues. Now I think I’ll give it to someone who can appreciate the kuru toga more. Kiwi-d: Taking the angle into consideration is a very good point I had not thought of this before you mentioned it. I checked and the angle I use is less than 45°. A low angle and using little pressure together might be the problem. RR4U: I can get the engine to work if I press harder, so the Kuru Toga engine itself is working in my pencil. It is great that the Kuru Toga engine works for you and I have no doubt that there will be new versions out soon. I just tested my Kuru Toga and as a fellow fp user – not brought up on them though – and knowing the ins and outs of that I would agree it is highly likely that it is not rotating for you out of lack of pressure. If you utilize a more classical typical angle of elevation for fountainpen use, like say 45-50 degrees or lower and gliding pressure or give and take some, the mechanism just wont rotate (the angle probably elevates pressure even more), and cursive or any kind of script, like you noted, is out of the question. I personally grew up using felt/hard-tipped drawing pens and ballpoints and the odd mechanical pencil and only started using fountain pens later so im used to high angles as well as at times applying pressure and mainly using my pens for drawing and hence guided by getting certain results, but I also have a light hand – like, getting-a-0.1 mm-line-out-of-a-ballpoint-light without thinking twice about it half of the time – so I understand the issue. Very little pressure is required for the mechanism to work. If you infrequently lift your pencil, there won’t be much rotation. Barely touching the tip of the pencil engages the mechanism, for me. Perhaps you have a bad pencil? NateB: You are right that there is only very little pressure required, but it looks as if Ruby has the same problem and pe can replicate it without changing his/her style of writing very much. That’s why I think it is unlikely I have a “bad pencil”. I just got this pencil today and have been using it most of the day. It does in fact rotate fine for me, but I do press pretty hard when I write. I did try to vary my pressure and it continued to rotate. It is a neat concept and the writing experience is good. My other comment is regarding your comment about retractable sleeves. I truly detest retractable sleeves. It seems like another potential point of failure and they never feel solid to me. The good thing about this is that I do not carry pencils in my pocket, so no need to worry about the sleeve causing any damage or discomfort. Good info by the way. d0gc0w, The Staedtler 775 has a retractable sleeve that feels rock solid, but if you do not carry pencils in your pocket it really does not make a difference. xDD, I can assure you that I did understand how the technology works. If I am, as you call it, “in a rush” it also works (as described in the original post). As discussed previously it might be because of the angle I use and there are also other Kuru Toga users with the same problem (i.e. just because it works for you and many other people does not mean it has to work for everybody). I’ve used quite a few Kuru Togas and own one of the 0.5mm versions, and I agree with the original poster that you need to use a certain amount of force to engage the mechanism, particularly if you hold the pencil at a fairly low angle. I prefer using softer lead and much less pressure, and get pretty inconsistent results most of the time, unless I change my writing style. Holding the pencil so the logo appears between my thumb and index finger, I can write a complete sentence without seeing the logo move at all. The thing that bothers me about the Kuru Toga most though is the play that is needed to use the mechanism. I prefer to write very small characters, and precision is important. When writing much larger, it’s not an issue, but for tiny, complex characters, there’s a bit of a tactile disconnect, which makes the whole thing feel less precise. It reminds me a bit of some retractable-sleeve pencils with a lot of wobble to them. For some people, it’s the bee’s knees. It’s quite popular where I live, but most of the people I know press quite hard when they write. With a good fountain pen or a high-end gel pen, there’s pretty much no need to apply pressure while writing. That doesn’t always translate well to pencils, and certainly doesn’t translate well to the Kuru Toga. Well – I finally got a Kuru Toga and I’ve been using it exclusively for a few weeks now and got through a pack of leads. I’m a light writer and I use pencil for everything except things like forms and cheques. I usually go for B lead to get dark lines and less pressure. I haven’t found any problem getting the engine thingy to work even at very light pressure so I deliberately tried to make it fail. Extremely low angles would do it but the angle is about where you’d be using a pencil to shade a drawing – almost parallel to the paper. Not quite such extreme angles and very light pressure also make it stop. It doesn’t work well with very cursive writing where the pencil stays on the page for an entire word and all the letters are joined by loops and curls. Being kept motionless this way the engine sometimes failed at the end of a long word. Pressing hard to advance the lead gummed it up completely. The only solution was to retract the lead and start again. Overall, I’m impressed. Whole pages of writing without the line getting thick and the letters blurry. It does what it claims. It keeps a sharp edge on the lead and provideds a consistent line. I wouldn’t use a sharp pencil on newsprint so I’m not going to be using this one for crosswords. For that I’ll stick to my 4B Staedtler traditions and the blunt setting on my sharpener. But for multi page drafts this is the one I’ll be using. I’ve seen similar problems – I write at fairly shallow angles – usually around 40 degrees, and the lead doesn’t always rotate. Steeper angles, and it works fine, but that doesn’t help when I don’t write that way! This is compounded by cursive writing – even if I force myself to write at a steep angle, the mechanism only “clicks” the lead around when I lift the pencil, then return it to the paper; after only two or three words, it’s not uncommon to have a chiselled point as with traditional pencils. Nice concept, but very dependent on writing styles – for some, it just isn’t going to work. After some testing I have done with my two kurutoga pencila, the problem is not the pressure but long words or lines. If your are kin to write words without lifting your pencils, then the mechanism simply can’t work. However if your write a word letter by letter the mechanism works!! Robert, I agree with the problem with the play. If I write in my small notebook lower-case characters tend to be around 1mm tall and play adds something an issue to be kept in mind in this case. Michael, thanks for trying it at low angles and letting us know. It’s really not a bad pencil. It’s certainly great that they made this happen, but even they I admire the thoughts that went into it I am slightly disappointed with the reality – but it’s nevertheless a nice mechanical pencil, even more so if it works for you. bard, thanks for your post. I am glad to hear others have the same issue, because there are so many voices that try to convince that the issues I mentioned are non-existent. Kosmas, not for me. Might be my Kuru Toga, I only have one so cannot compare, the angle or the pressure I use or other factors. I had this pencil for awhile – long story short, didn’t like it. Lead that usually comes out dark in other pencils come off pretty light here. This is technically v 1.0 of three. So I moved to the next version up (High Grade) which I preferred as it had more heft than this one. When I traveled in Japan, one of my colleagues asked me to buy a special functional pencil for his daughter. I looked for many pencils and I choose KURUTOGA pencil which I can see only illustration about self-sharpen. Several of my colleagues wandered how does it work, because it has only Japanese language on the package. In the first time we find how to turn on the KURUTOGA engine to make it rotates -_-” because it does not seem to rotate the lead. We wrote for a while and noticed the swirl symbol inside the pencil. It rotates approx. 30 degree for 1 row of A4 (I use normal pressure). As many of you have post about problems, I’m not sure is it because of writing in different language. For example, English language can be written one word without lifting the pencil, while Japanese have to lift the pencil several times for one word. Therefore Japanese language may be rotated 10 times faster than English (Just my guessing). I don’t use a pencil much, but I think it’s a great thing as when I was a student I had to rotate my pencil as usually. Anyway, my colleague’s daughter is quite happy with this special pencil. I agree that the pencil works great if you write letter by letter, more than whole words. Either way not a bad pencil, no issues yet. The mechanism only works when the pencil is lifted, so if you were to only draw a line around the page then the led wont rotate. That was my first test and did disappoint me, but hey this is a pencil to be used for writing, not drawing. Would be nice if the packaging mentioned how the pencil works, otherwise the customer may believe that the pencil doesn’t work. 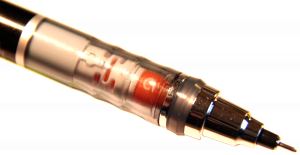 Is the Kuru Toga Roulette available in 0.3mm? Both the original and the High Grade have 0.3mm models so it seems strange that the top of the line doesn’t. I currently use one of the original 0.5mm pencils which I found at WalMart. It is okay but I would prefer to have a Roulette in 0.3mm. I am aware that I can buy the other models from a number of online sources but the Roulette has a better grip. I purchased by first Kuru Toga a week ago. I accidentally bought a 0.7mm (they had both 0.5 and 0.7 versions of different colours — the first one I picked up was a 0.5 and when I changed colours I inadvertently picked up a 0.7). I have been immensely impressed with it. I noted that the slightest pressure triggered the auto-rotate action and this ensured you never wrote with a flat wedge tip that approached anywhere near the width of the actual lead. Simplistically put, the pencil wrote with thinner strokes than my Staedtler 0.5mm pencil (even though I would rotate the Staedtler in my hand). A week later I went and bought a 0.5mm because, hey, if the 0.7mm wrote with strokes that appeared thinner than a regular 0.5mm, how awesome would the 0.5 Kuru Toga be? Well, this is where I discovered not all Kuru Togas are equal. The first 0.5 I picked up required more pressure than I wrote with (I was on the lookout for this, because I also bought some 2B leads for it and I write with 2B so that I get dark enough text AND can still rub that text out without marks [because the paper hasn’t been indented through pressure]). Luckily, the pencils are in a rack (Office Works in Australia) and I could compare pressure between the Kuru Togas. I found a 0.5mm that would activate on light pressure (just like my first 0.7mm Kuru Toga). The end result is I have a pencil I’m really, really happy with. It’s a plastic 0.5mm Kuru Toga running 0.5mm 2B [Uni Nano Dia Blended] lead. My only gripe is the eraser. It’s uselessly tiny. As a result, I now carry a dedicated clutch eraser (like a clutch pencil, but it dispenses eraser). I thought I’d share this because, from my experience, there does seem to be a quality control issue with Kuru Toga pencil manufacture [at least as far as the plastic ones are concerned] because I’ve experienced ones that require what I’d call too much pressure to work. My suggestion then is to only buy the pencils where they’re sold loose, so you can pick ’em up and try ’em. The simplest way to test them is by lightly pressing the pencil against your thumb’s fingernail and observing if the lead mechanism (there’s a plastic doover under the plastic with a mark on it that you can observe) is moving. Ant, that is very interesting – earlier I speculated that I got a sub-standard pencil. Your experience shows that this seems to be a real issue. I’ve never seen them sold “open” in the UK, even in high street shops their on cardboard/blister packs, so unfortunately it doesn’t seem to be easy to find a place where you can try them first. Where to buy kuru toga pencil in Malaysia klang selangor . Please tell me, I really want to buy it. Please …………..
I’ve been looking at the Kuru Toga for a long time, and finally I got one yesterday. I sadly have the same problem as memm, and can confirm that it isn’t merely a defective pencil. My wife and friend have no problem activating the mechanism consistently, and there are two pencils involved with consistent results. So the conclusion I’ve drawn is that it’s indeed a matter of pressure and perhaps angle when writing. I’m used to mechanical pencils and I generally never break leads. I hold the pencil at a roughly 40 degree angle, and usually rotate it myself every couple of words (something I had to consciously stop when trying the Kuru Toga). I’m not a fountain pen user, and generally use a mix of ballpoint pen and mechanical pencil at work. Sadly this pencil just isn’t for everyone. The construction seems good, though the material choices and weight aren’t my particular favorites (the regular Kuru Toga is almost entirely plastic, quite light, and neutrally weighted). Thanks for the review, I’m glad I’m not alone! Michel, I assume you already tried looking on the Internet. Unfortunately I cannot help you, but I hope you will find a place where you can get it. Litus, sorry to hear about your bad experience, but I’m happy to know that I am not imagining things and that others have experienced the same issues. Thanks to Gunther ( Lexikaliker.de ) I had a chance to try more Kuru Togas. I didn’t do a direct comparison yet, but I think the other Kuru Toga I have tried needed less pressure to ‘activate’. Like you say, the construction seems good. This pencil is so much more complicated than many other pens (mechanical pencils, fountain pens) that sell for much more. Value for money is great, it just doesn’t work on all pencils for all types of users. Hello, i’m a mathematician and i love to use mechanicals pencils. Also i love to use a 0,5 4b in the pencils. I bought today and it does’nt work for me either. My pencil is from Japan, the box is written in japanese letters, so it is an original Kuru Toga. Hello Ariel, 4B seems quite soft, does it not smudge when you write with such a soft lead? If you want such a soft lead, maybe you use extremely few pressure – not enough to set the mechanism off. The lead rotates when you lift the pencil OFF the papaer-not while writing. yeah same, i was a little disappointed at how much pressure you have to push down on the pencil in order for it to rotate. しゅう, it’s nice and good looking, I agree. I hope future version will have an improved mechanism.